Alex Killpartrick was born in the West Country. Bath. His father was a DJ, jockeying discs around the country from the 1960s to the 1990s and coming from Leeds, closer to the Northern Soul music that made up most of his collection than he was to the music of the West Country. From an early age, Alex was intrigued by his father's DJ kit, looking to see how things worked and building 'speakers' out of cardboard boxes when he was just four. 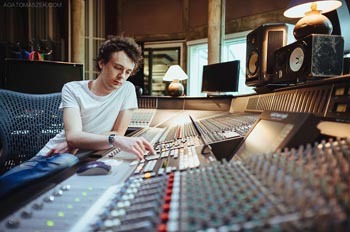 When he was eleven, Alex's father took him to visit Steve Winwood's recording studio in the Cotswolds. Alex was fascinated and on the way back, his father gave him a budget to spend on recording equipment. Alex bought his first mixer, some sound cards and other items that took them over the budget. They sneaked it into the house when they arrived home. Around that time Alex started to play keyboards. His teacher was frustrated that Alex was remembering pieces rather than learning to read music properly. Nevertheless, you couldn't question the commitment of Alex and his friend Jeff Carpenter and the time they spent with a Casio keyboard and basic Sound Foundry Acid software experimenting with music on the computer. 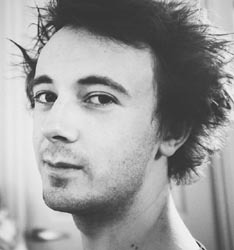 In his teens, Alex worked on Saturdays at the Bang and Olufsen shop in Bath. Staff would bring in their own records and play them on shuffle on the multiple CD player. This is where Alex began to hear jazz; albums by Miles Davis and Wayne Shorter's Speak No Evil stay in his memory. 'It got the the stage where I would spend half of my earnings each week on CDs, and I wasn't paid that much!' he remembers. In 2009 Alex left Kingswood School in Bath with certificates that included an A Level in Music. He applied to the Royal Welsh College of Music and Drama in Cardiff to study Creative Music Technology. We often take for granted the recorded music we listen to. Rarely do we think about the process that has taken place to bring that music to us, nor that what was originally recorded is not always the way it sounds on the recording. Alex points to early recordings by Blues singer Robert Johnson and the debate that his recordings were released at a different speed (click here). Similarly, Richard Alabone in an article on this site (click here) discusses how early jazz recordings were not made as we hear them. Much depends on how recording equipment is used. There was a story that Bix Beiderbeck's Blue River had a microphone in front of the band and when the time came, Bix moved to the back of the band to play behind Bill Challis's vocal and then down to the front to play by the mic. for his solo that follows. Whether that is true, who can say, click here to see what you think. 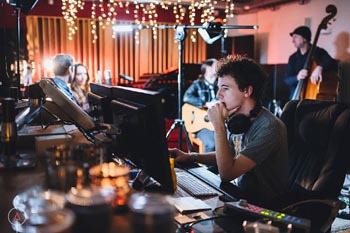 Since then things have changed radically both in terms of the recording and mixing technology available and the experience of recording engineers. As the use of technology has increased, jazz musicians have begun to incorporate it into their compositions - at a 'simple' level, watch how guitar players set up loops when they play, at another, listen to the work of Beaker that we featured in Full Focus recently. For some musicians they have used it to extended the possibilities of their improvisation, for others they have involved engineers in their work from the outset with a view to the way the music will sound when it is played. Alex Killpartrick is already becoming busy. 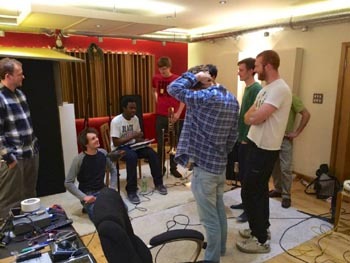 As people get to know of his work, experience and understanding of the needs of jazz musicians they seek him out. Alex has been behind a number of recent albums - here are samples from some of them: Kit Downes Tom Green Septet's album Skyline, Kit Downes and Lucy Railton's Tricko Tareco album, Blue Eyed Hawk's Under The Moon, Snowpoet's Butterfly and Misha Mullov-Abbado's New Ansonia. Click here for Alex Killpartrick's website and contact details.